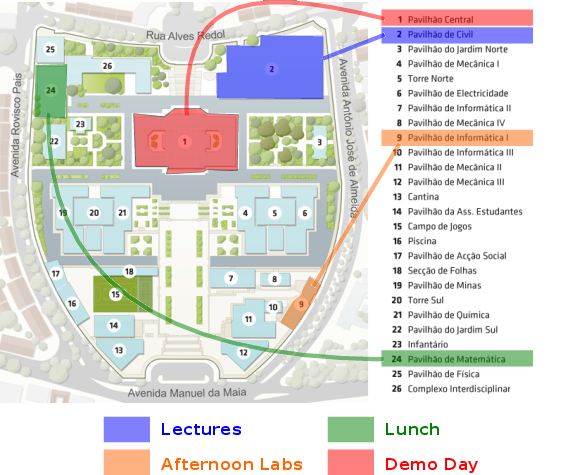 The summer school will take place in Instituto Superior Técnico, which is located in the heart of Lisbon. Situated in the west coast of Portugal, where the Tagus river meets the Atlantic Ocean, Lisbon is the westernmost capital in mainland Europe. The light, the atmosphere, and the climate offer marvelous walks all over the city. Lisbon is an extremely lively city, with a wealth of cultural events happening every day, and a vibrant nightlife. A huge selection of restaurants is available, featuring Portuguese and international cuisine. In July the weather is usually very pleasant, with sunny days and warm temperatures (30ºC – 86ºF). There are several beaches a few minutes away from the center. The public transportation system is far-reaching and reliable, and has the Metro (subway) as its main backbone. Lisbon can be easily reached by daily direct flights from major international cities. We recommend the student residency, which offers good rooms for a very cheap price starting at 25 euros per night. There is a direct connection between the residency and the summer school venue. Please check more detail at http://na.ist.utl.pt/en/rdp/alojamento-de-verao/. On the other hand if you prefer a little bit more of city action, some of the best reasonably-priced hostels in the World can be found in Lisbon, right in the middle of the historic and night life district. There are plenty low-budget options in Lisbon starting from 25 euros a night for a shared dorm to a 50 euros room. Please check more details at http://hostelsinportugal.com/site/hostels-lisboa. You now have a subway connection from the airport to the subway close to the Hotel. Take the subway on the airport (red line) until Alameda.